If you leave your tools dirty after use, they may rust and perform poorly in time. After you are done working, be sure to take the time and clean your tools properly. First, use a rag to wipe off any grease or dirt. Then, lightly spray some WD-40 on the tool and let it sit for a few seconds. Before it dries on its own, wipe the tool off with a clean rag and put the tool back where it belongs. 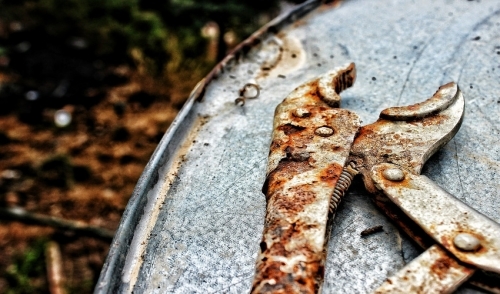 These simple steps can keep your tools rust free for years to come. If you've neglected your garden tools and they've become rusty since the last time you’ve used them, don’t worry -- WD-40 can fix them right up. Spray it onto the tools and let it sit for a while. Using steel wool, rub the tool and watch the surface rust come right off. Follow the above procedure for routine cleaning, thus avoiding the same problem in the future.